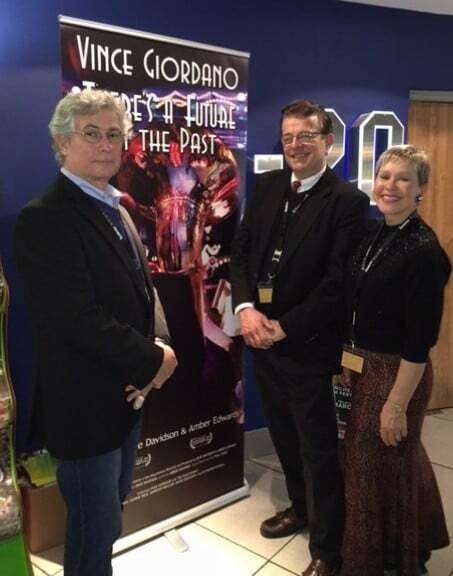 “Vince Giordano—There’s a Future in the Past” won the Best Music Score Award at the Manchester International Film Festival, where it had its world premiere on March 5, 2016 in that vibrant UK city. Vince Giordano and filmmakers Dave Davidson and Amber Edwards were all on-hand for the screening, talk-back, and awards ceremony. Dave Davidson, Vince Giordano, and Amber Edwards at the Printworks Odeon in Manchester, England.